A couple days ago, we posted 10 Burning Questions leading up to the 2014 Michigan Football season. A total of 228 of you took the time to respond to the poll. Here are your answers. 1. Is Brady Hoke on the hot seat? Simple enough, right? The biggest question of the off-season so I figured just get it out of the way early. Warranted or not, it would seem that Brady Hoke is very much on the fans hot seat. I would argue though that if Hoke doesn't deliver the kind of season that gets him off the hot seat, say 7 or 8 wins with losses to MSU, Ohio State and a couple other teams, I still think he keeps his job. Brandon isn't going to be so quick to hit the reset button, especially on his own hand-picked guy. Plus, fire Hoke after year 4, after firing Rich Rod after year 3…and all of the sudden, we're Notre Dame. This is a general mood question. While some of us, myself included have been having a tough time getting jacked for the 2014 season, 57% of you feel different. And 2% of you are still holding your breaths for Jim Harbaugh to magically appear inside Schembechler Hall. The biggest and frankly the best story of the offseason for Michigan was the acquisition of Alabama offensive coordinator Doug Nussmeier. The wagons had been circled pretty hard on Al Borges by the end of the season and it was clear a change needed to happen. By all accounts Nussmeier was a home run hire. But Michigan fans will not be fooled. You have to earn it around here. We all know improving the OL is where Michigan's focus needs to be. But its not the only thing that needs attention. I was really curious what would come in 2nd here. You could say OL and the running game are very much related, thus why they came in 1 and 2. I was tempted to call game prep/management simply "Hoke wearing a headset", but decided not to. 5. Who will be Michigan's starting RB in week 1? Despite having the 103rd ranked rushing offense in the country a year ago (and top RB, Fitz Toussaint leaving), Michigan does actually have some depth (and good depth) and the RB position. Justice Hayes saw a lot of time with the 1's in the spring game, but only cracked 3% of the fan's vote. I think he'll see a lot of the field this year. But I agree, I think a Derrick Green/DeVeon Smith combo is the most like scenario in week 1. Nussmeier and Freddy J will use their entire stable of backs until someone separates themselves. 6. How many rushing yards will Michigan have this year? Really, this is a question about people's faith that the OL will get better this year. Michigan had 1,634 yards on the ground last year…which is lower than its been in a very long time. Even in 2008 when the sun refused to shine, Michigan ran for 137 more yards than they did a year ago. I gotta hand it to the 2% of you that think its going to be all 2010 again where Michigan runs for over 3,000 yards (obviously aided by Denard's 1,702 yards that year). 7. When will Jabrill Peppers become a starter? So 5% of you think Peppers won't start until next year? That's bold. But I think you're wrong. Dude's gonna see the field a lot this year. Maybe not in week 1, but by the end of September he's going to find his spot on this defense. 8. How many regular season games will Michigan win in 2014? 9. 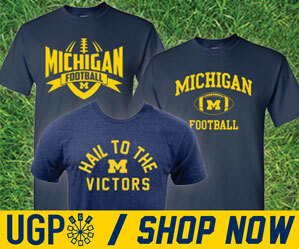 Which rivals will Michigan beat in 2014? The percentages are wrong because they had to add up to 100. But 228 people voted in this poll, so the breakdown of folks who think we'll beat Notre Dame is 70%, Michigan State 55% and Ohio State 35%. 7% think we'll lose all 3. 10. Which school will win the Big Ten this season? There's a lot of respect for Ohio State going into 2014. Frankly, I don't really know where its coming from. The OL needs to be rebuilt, the defense has a lot of work to do to be good again and I still think there are a lot of questions about Braxton Miller's durability (and who's his backup now?). Either way, OSU is always in the conversation. The biggest question is how will Michigan State respond to all of its success last year? And what about the west division…who's good out there? I don't think there any clear favorite in either division this season. It could get messy, but it should be a lot of fun to watch. So, that's it. Thanks to everyone to participated in the poll. You guys rock. Let's do this again sometime.